Slate templates are currently available for android and windows phone as libraries. They can be easily integrated into your native apps. Let's look at a short example. More examples are available at the bottom of this page and on github. There is also a full documentation and api guide on the github wiki. 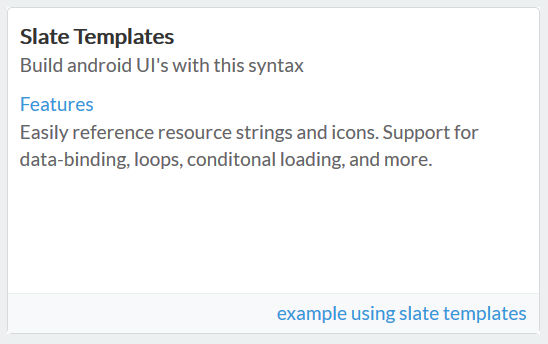 p  "Build android UI's with this syntax"
The easy and concise syntax in slate templates is almost 40% to 60% less than the xml required to build the same UI in android and windows! 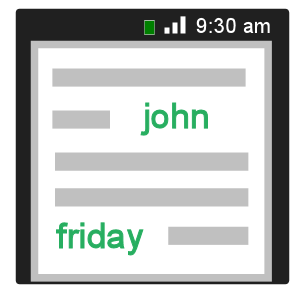 Slate templates are used in a production android calendar app on google play. The templates are used to generate cards or what we call "boards" on the home page. Check out Slate Calendar for live examples. Lets dive into some details.. Slate syntax is very intuitive, concise and similar to code. As a result, it significantly reduces both the complexity and size. 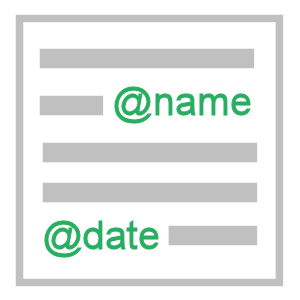 Some elements have blocks to allow child elements, such as "list"
Elements have default attributes, so you can leave out the "key="
Currently, slate templates are available for android and windows as libraries. 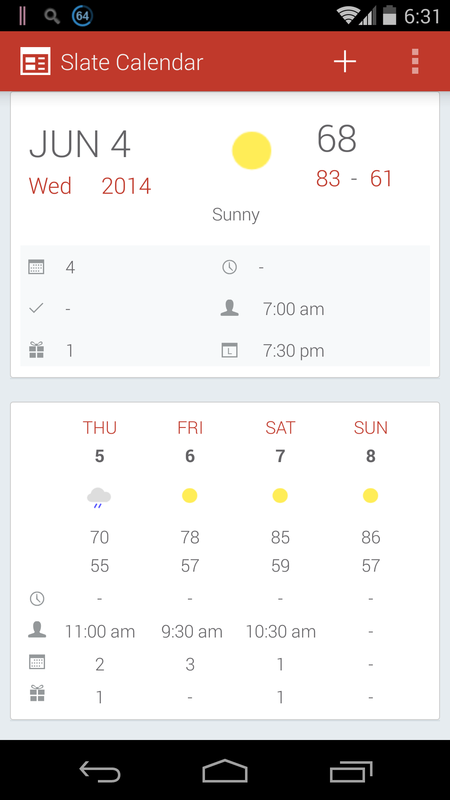 For android, slate templates are used in a production android calendar app, that is currently available on google play. Check out Slate Calendar. The windows version is also available as more of an alpha version. With slate, you can store your templates on your server or cloud storage and fetch them at runtime! 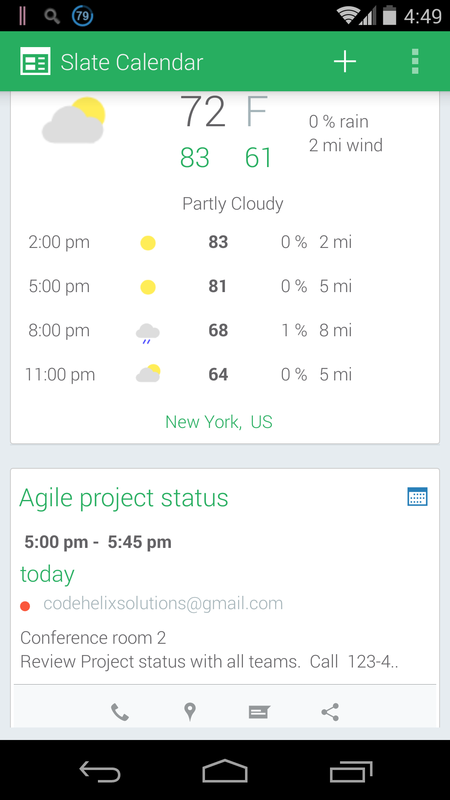 This allows you to control your UI and display centrally without having to re-submit your app to the store. Compare this with android and windows, where your pages / controls / views are representing in xml files that have to be packaged as part of your app. // 2. Load template file from assets folder. // device functionality... only data supplied. One of the core problems with mobile UI development is handling different resolutions. Slate solves a big part of this problem by supporting relative or percentage based widths. Typically, you have to set up the width of an android control to be MATCH_PARENT, WRAP_CONTENT or a physical number dp (device independent pixels). The problem is that even the dp's vary from device to device. By supporting % widths ( in addition to WRAP_CONTENT ), slates solves a number of resolution issues, while keeping the code base very small. Later on we will see how relative margins and padding are also supported. 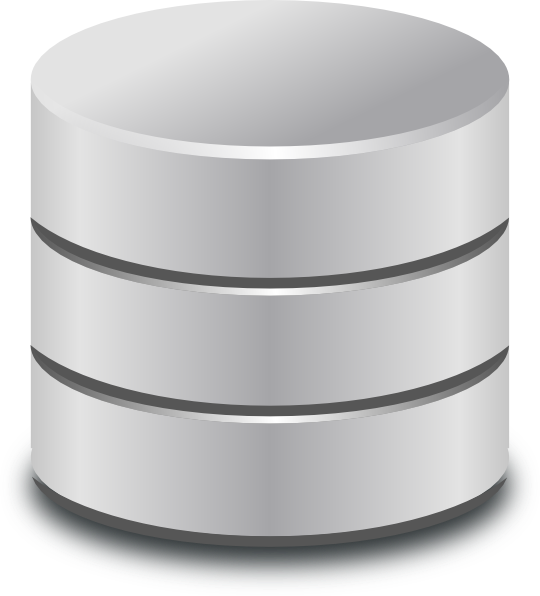 Slate templates are secure in that they can only access data ( lists, objects, maps ) that you supply to the system. There is currently no way for the templates to access any system / device level features. Also, the templating system has been designed to be mostly logic-less, similar to handlebars or mustache js. For example, there are no if conditions but you can optionally load/disable controls from being shown. // to store all your styles for UI elements. // but putting the variables inside the 'vars' block. // width and height calculations. // You can use the variables using the '@' symbol. // 1. intialize using the activity. // strings and images and styles. // 5. OPTIONAL: setup some sample data to use in template. Slate templating engine is currently closed source for the time being, but we will very soon open-source parts of the templating engine to support extensibility. For example, some of the features currently in the engine, such as mock data and pre-processor definitions, are implemented as plugins. We will open up areas for other developers to extend parts of the system. Slate templates can be used under the following restrictions and considerations. Please contact us for custom needs and requirements. You can NOT do the following regardless of personal / commercial use. NOTES: All the common restrictions listed above apply. 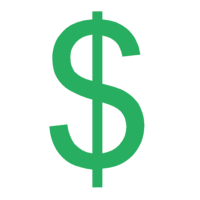 your android/windows based app must be free without in-app purchases. beta version is free to use for both personal and commercial use. Slate Templates is a product of Code Helix Solutions Inc., a software and mobile development company. We develop open-source software, and are also currently focused on developing tools for the android and windows phone platforms. 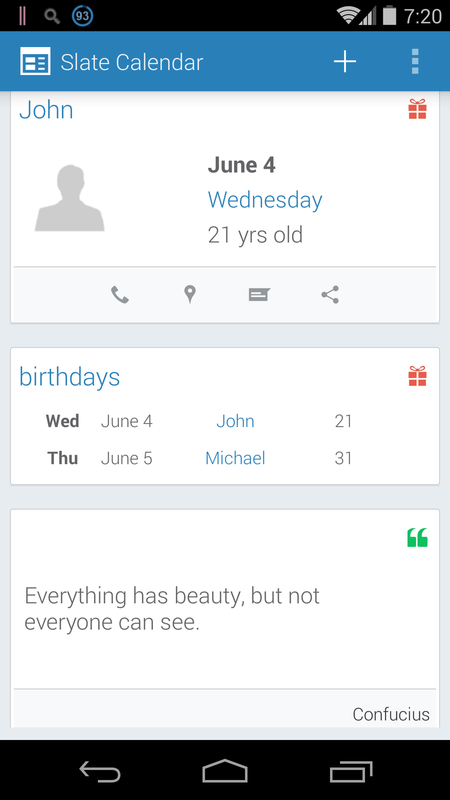 Slate Calendar is our core mobile application. Mahesh is co-founder of CodeHelix Solutions Inc., and is involved in product management and development activities. We have a small 2-3 person team of consultants working in india. You can contact @kishorereddy or email "kishore@codehelix.co" for more information about slate templates. Feel free to post questions, issues, feature requests on the git hub issue tracker. We will be monitoring this routinely for both issues ( in beta ) as well potential feature requests. You will also find a list of prioritized upcoming features. Documentation on how to use the templates are located at the Slate Templates Wiki. You will also find docs on how to integrate with android and soon windows.